These are the slides that accompanied a lecture introducing the Committee on Foreign Investment in the United States (CFIUS), which reviews inbound investment into the US for national security concerns. The lecture introduces CFIUS: its purpose, membership, history, governing statutes, process, and results. 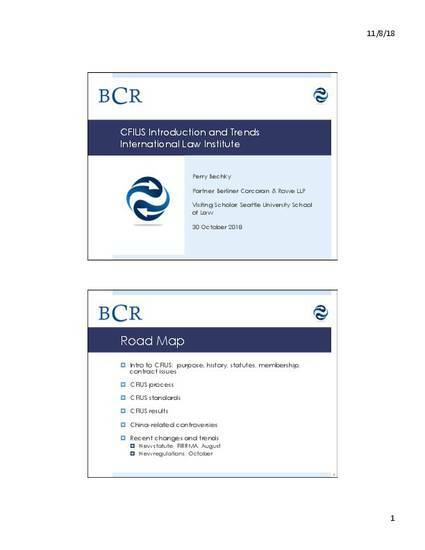 The lecture also focuses on recent trends and developments, especially controversies about outbound investment from China and passage of a law (FIRRMA) amending the CFIUS process and CFIUS's initial implementing regulations. The full text of the lecture is not available, but questions may be directed to the author.